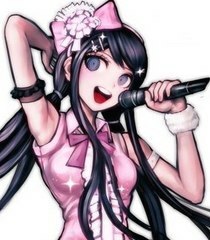 Introduce yourself as Maizono, or if the song you're singing has spoken parts in it that works as well. I can read minds. Relax, It's a joke. I just have good intuitions. I can read minds... Relax, it's a joke--actually, it's because I'm an esper!... Haha, I just have good intuition, that's all. Thank you so much, Naegi. I really do trust you, you know. I can read minds Relax, it's a joke. I just have good intuitions. Naegi-kun, have we met somewhere before...? Wait, that's it! We went to middle school together! Hehehe, I'm more sturdy than I look, don't worry. N-no!! I've gotta get out of here... I've gotta get out of here right now! !